A bit more unsettled than last week, this week has given us days of rain, sun, clouds, wind, thunderstorms, and even cold temperatures! This afternoon it is raining steadily here in St. Peter, but today’s precipitation should let up later this afternoon/evening before more returns sometime tomorrow afternoon. There is a chance of storms both tomorrow and Monday, so unfortunately our Memorial Day Weekend might not be as dry and stable as we’re all hoping it will be. After a high in the 80’s next Monday, though, temperatures look to remain in the mid-70’s during the day as the sun shines through most of next week. All this precipitation is giving the Linnaeus Arboretum one of its greenest starts to summer in recent memory. The college’s lawns of Kentucky bluegrass are lush and vibrant, and all of the perennial gardens surrounding the Interpretive Center (including most recently the Greater Gustavus Hosta Garden) are thick with green foliage. But as all the deciduous trees have more or less fully leafed out, so have most of last week’s blossoms of crabapples, chokecherries, and redbuds fallen to the ground. 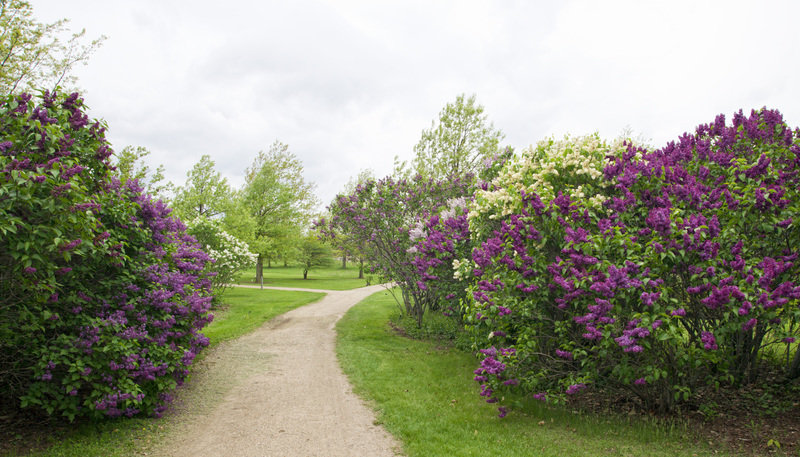 A sweet spot still remains, however, just west of the Interpretive Center: the First Ladies’ Lilac Walk is currently exhibiting peak bloom and fragrance. Lilacs in full bloom and fragrance west of Interpretive Center, 5/27/11. **As in the previous June, I will be conducting grassland bird surveys throughout western Minnesota over the next month, and thus my time on campus and in the Linnaeus Arboretum will be very limited. Watch for the next “Arb Sightings” in early July.